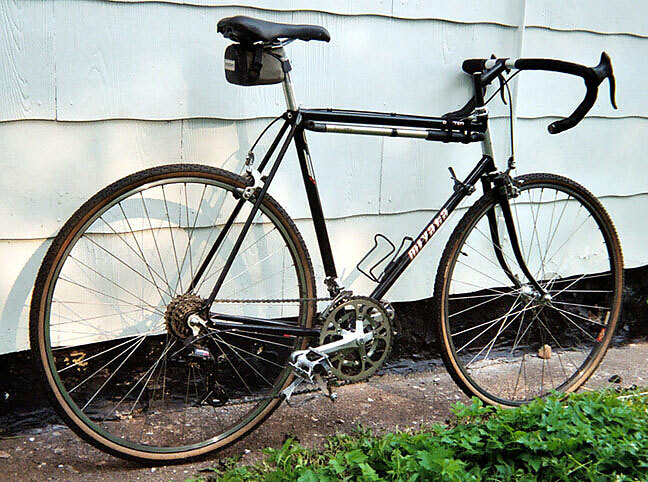 Here's the Miyata 110 that I found out for the trash one day. When I found it, there were no wheels, bent handlebars and the fork legs were bent. I started tearing it down and piecing it back together slowly, but one night I started and couldn't stop, just completing this with whatever I had in the spare parts bin. By 3 am I had a pretty decent bike! Since then I've swapped handlebars to what you see here and I *really* like this bike. If surley can have a "Karate Monkey" I can have this one be a "Bad Monkey." I believe it was originally designed for 27" wheels, but my 700c's fit great. It's set up sort-of cyclocrossish but I ride it everywhere, more like a Rivendell Atlantis. 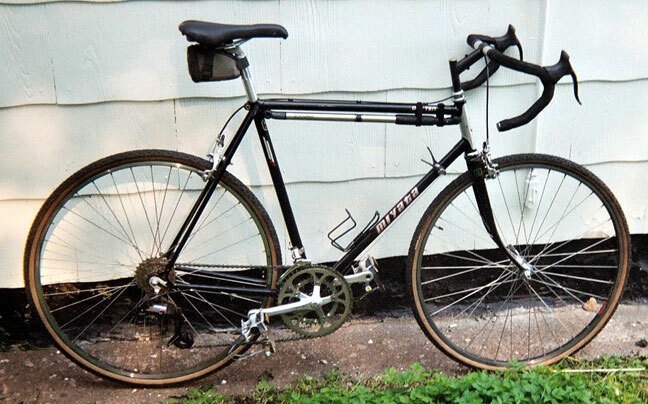 -Clamp on donwtube shifters; I replaced the levers with Dark Grey 105 7/Friction levers I've had for a few years. -Shimano 600 single pivot sidepulls with new Ultegra pads. May swap out later for centerpulls, but they got clearance for big tires and fenders. Obviously it's a real mongrel mix of parts. After getting it eventually dialed in, this is my new favorite bike.